2. HQ, Department of the Army. TM 5-855-1 Fundamental of Protective Design for Conventional Weapons (November 1986); 271 pages, 92 plus illus. 3. Department of the Navy, Naval Facilities Engineering Command. Design Manual 2.08 Blast Resistant Structures (December 1986); 375 pages, 94 illus. 1. 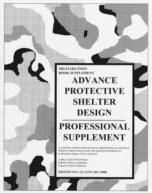 We also have an other book supplement along with this supplement: Basic Supplement, as well as the basic book: Advance Protective Shelter Design.